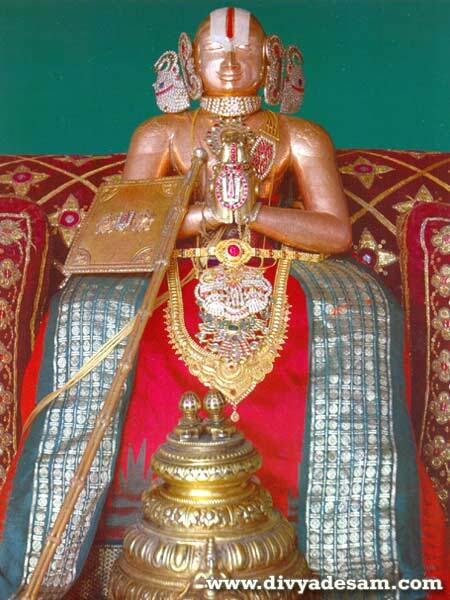 In srIvaishNava sampradhAyam AchAryan is worshipped with greatly reverence. bhagavAn being the antharyAmi, directs the jIvAthmA to a suitable AchAryan first and subsequently the AchAryan reveals the most valuable principles about bhagavAn to the sishyan. After developing proper understanding about bhagavAn, his svarUpam (nature), rUpam (forms), guNams (qualities), ishvaryam (wealth, controlling ability), etc., jIvAthmA truly develops the attachment to serve such unparallel bhagavAn srIman nArAyaNan. 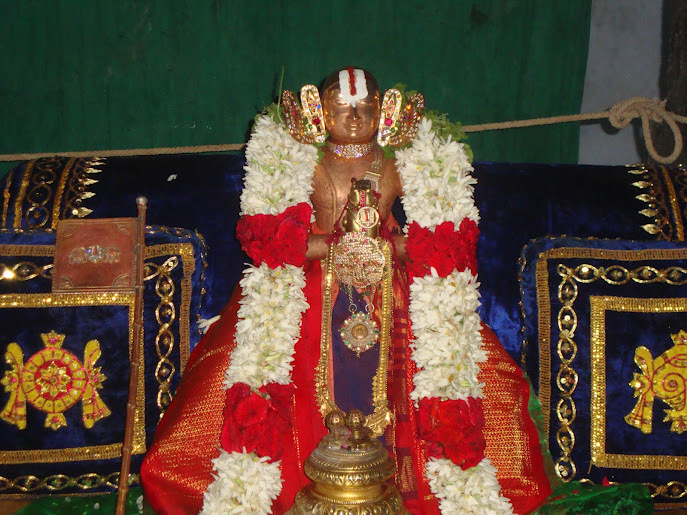 AchAryan is also glorified as the manifestation of periya pirAtti (srI mahAlakshmi thAyAr) in this world. pirAtti ensures that emperumAn only looks at the upliftment of the jIvAthmA and ignores the faults of him.AchAryan also ensures that the sishyan is some how uplifted even beyond his limitations. It is because of this invaluable favour done by AchAryan, sishyan has great responsibility towards the AchAryan while in this world (and after reaching paramapadham as well). piLLai lOkAchAryar in his srIvachana bhUshaNa dhivya sAsthram explains the responsibility of AchAryan and sishyan towards each other in sUthram 333 beautifully. AchAryan should focus on nurturing the svarUpam (the true nature - sEshathvam - servitude) of sishyan; sishyan should nurture the dhEham (body and bodily needs) of AchAryan. This means AchAryan's prime responsibility towards sishyan is to perform Athma rakshaNam (protecting the AthmA) and sishyan's prime responsibility towards AchAryan is to perform dhEha rakshaNam (protecting the divine body of the AchAryan). In the subsequent sUthrams, it is explained that sishyan trying to do Athma rakshaNam of AchAryan and AchAryan trying to do dhEha rakshaNam of sishyan is not proper etiquette. mAmunigaL also beautifully explains this same principle in upadhEsa rathina mAlai. In the final 21 pAsurams, mAmunigaL brings out the glories of srIvachana bhUshaNam and the essence of srIvachana bhUshaNam. In the 61st pAsuram, he declares that once we surrender unto an AchAryan who is well established in both gyAnam (proper knowledge) and anushtAnam (practically following the proper knowledge), bhagavAn will automatically grant entry for us in to the paramapadham. In the 62nd pAsuram, he says, for the ones who have great attachment to their AchAryas lotus feet, paramapadham is guaranteed. In the 63rd and 64th pAsuram, he explains that once we understand the favours done to us by our AchAryan, we will automatically have great attachment towards him, will never be able to bear the separation from him and will have to constantly serve him while he is in this world. In 65th pAsuram, he identifies that AchAryan is the one who takes care of the svarUpam (AthmA) of the sishyas and sishyan is the one who properly takes care of the rUpam (body). But he also identifies that it is very difficult to have this nishtai. 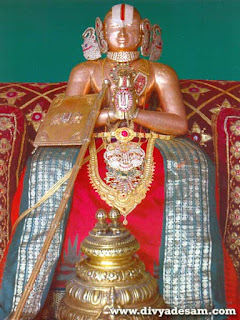 In the 66th pAsuram, he identifies the ideal sishyan - pinbhazhagarAm perumAL jIyar who was greatly attached to nampiLLai's divine form and was even willing to delay his journey to paramapadham just to stay in srIrangam and have the divine dharshan of nampiLLai and have the opportunity to serve him everyday. Thus it is very important for both AchAryan and sishyan to fulfill their responsibilities and we can see how this is beautifully seen in the life of periya thirumalai nambi, emperumAnAr and embAr. 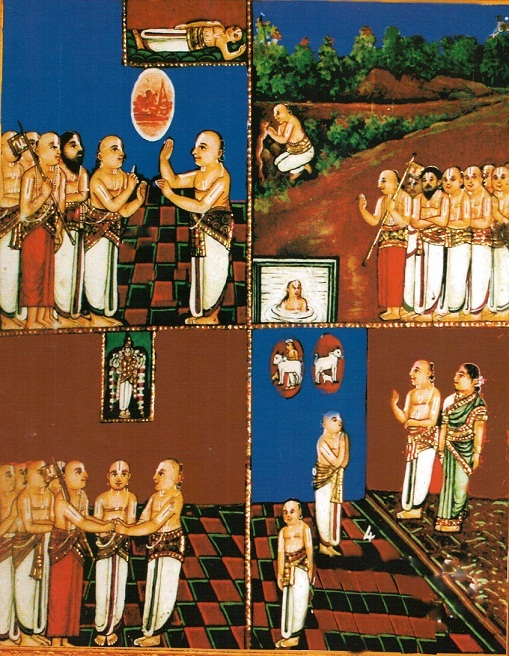 top left - gOvindha perumAL (embAr) checking the bed of his AchAryan (explained below). top right - gOvindha perumAL helping a suffering snake out of great compassion (explained in his charithram - http://guruparamparai.wordpress.com/2012/09/07/embar/. embAr's AchArya nishtai was unparallel to any one else and his life is a beautiful example for how a sishyan should lead their life serving the AchAryan and fulfilling his desires. Let us enjoy that now. embAr is a maternal cousin of emperumAnAr - he is the son of emperumAnAr's mother's younger sister. They both grew up together and studied in kAnchipuram under yAdhava prakAsa. gOvindha perumAL (childhood name of embAr) saved iLayAzhwAr (rAmAnujar) from being killed by yAdhava prakAsa's (adhvaithi scholar under whom, they both studied in the beginning) sishyas during the yAthrai to vAraNAsi. yAdhava prakAsa became very jealous about rAmAnujar's knowledge and reputation and his sishyas devised an evil plan, where they will kill rAmAnujar while going to kAsi. gOvindha perumAL, learning their cunning plan, averts the disaster by promptly saving rAmAnujar from their plot and sends him off to kAnchipuram at the right time. Thus embAr shows his attachment towards rAmAnujar right from the childhood. gOvindha perumAL continues with yAdhava prakAsa and he goes on to become a shiva bhaktha and stays in kALahasthi (near thirumalai-thirupathi). emperumAnAr sends his maternal uncle periya thirumalai nambi (srI saila pUrNar) who is one of his AchAryas to reform gOvindha perumAL and bring him back to srIvaishNavam. periya thirumalai nambi visits kALahasthi, demonstrates that only srIman nArAyaNan is the worshippable deity through proper pramANams (nAmmAzhwAr's pAsurams, ALavandhAr's sthOthra rathnam, etc) and reforms gOvindha perumAL. gOvindha perumAL realizing his mistake, at once, gives up all the attachments and surrenders to periya thirumalai nambi. periya thirumalai nambi then performs pancha samskAram to gOvindha perumAL and brings him back to thirupathi where gOvindha perumAL serves his AchAryan constantly. 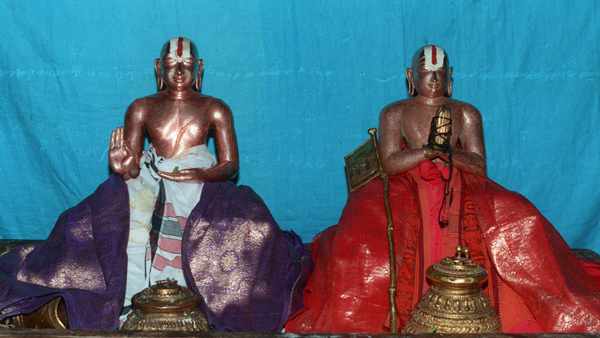 Thus emperumAnAr and periya thirumalai nambi performs Athma rakshaNam for gOvindha perumAL. Once, gOvindha perumAL prepares the bed for periya thirumalai nambi and lies down it first before his AchAryan lies down. When emperumAnAr sees this, he lets periya thirumalai nambi know about this and nambi enquires from gOvindha perumAL about the incident. gOvindha perumAL says he will get narakam for this act but he does not mind that. He says that he was testing to ensure that the bed will be very comfortable for his AchAryan. So he did not worry about his fate but was more concerned about his AchAryan’s thirumEni. 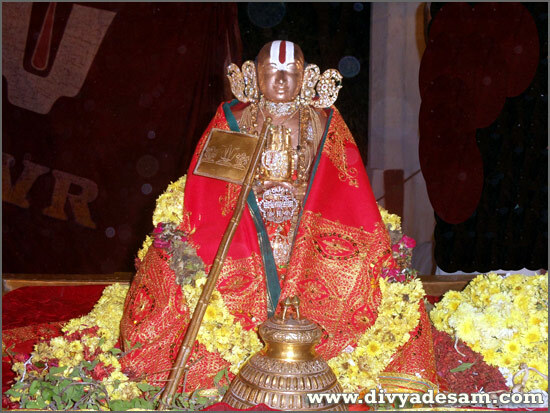 emperumAnAr visits thirupathi and learns srIrAmAyaNam from periya thirumalai nambi. After completion, while leaving to srIrangam, he requests gOvindha perumAL to be sent along with him to assist his mission in srIrangam. periya thirumalai nambi happily agrees and asks gOvindha perumAL to serve emperumAnAr like he serves periya thirumalai nambi. gOvindha perumAL reluctantly goes with emperumAnAr since he is not convinced to leave nambi (who is his AchAryan). After reaching kAnchipuram, he becomes very weak due to the separation from his AchAryan, so he returns to thirumalai nambi, but thirumalai nambi does not even opens the door for him and insists he should go back to emperumAnAr. gOvindha perumAL gets convinced and returns to emperumAnAr happily. gOvindha perumAL gets married but shows absolutely no interest in marital affairs. emperumAnAr notices this and then gives gOvindha perumAL sanyAsAsramam and names him embAr. embAr stays with him forever without separating and is famously become to be known as "rAmAnuja padha chAyA" - the shadow of the lotus feet of emperumAnAr. embAr is known to have great attachment towards emperumAnAr. Once when some people glorify embAr he happily accepts them. When emperumAnAr watches that and tells him that it is not proper etiquette to accept glorification to oneself and we should show some humility and reject those. embAr at once replies that any glorification of himself is due to the relationship with emperumAnAr only and thus it is only proper to accept them - since it ends up glorifying emperumAnAr. Thus we can see the beautiful relationship between periya thirumalai nambi, emperumAnAr and embAr where each one of them were properly fulfilling their responsibility and showing us the great principles by themselves practising them. embAr offers a beautiful pAsuram glorifiying the divine beauty and glories of emperumAnAr through which we can understand how a sishya should be situated in AchArya nishtai. Let us enjoy this beautiful pAsuram now. emperumAnAr's divine feet are soft and attractive like lotus flower and the toes (fingers) are like the cool petals. His lower body is beautifully decorated with a very pure and beautiful kAshAyam. His yagyOpavItham and the thridhaNdam (which is placed on his hand) are very beautiful. His mildly smiling lips which delivers the glorious words of pUrvAchAryas is more beautiful than the pleasing moon. His divine eyes which look like lotus petals and is full of mercy is very enchanting. His divine head which is decorated with nammAzhwAr's (kAri's son) lotus feet and the wonderfully tied tuft is mind boggling. there is no one equal to me, there is no one equal to me, there is no one equal to me. embAr brings out the essence of our pUrvAchArya's anushtAnam in this beautiful pAsuram. He narrates the beautiful form of emperumAnAr and demonstrates great fervour and attachment towards emperumAnAr and his form every moment. In these eight lines, he explains the beautiful form of emperumAnAr, his svarUpam of being nammAzhwAr's lotus feet, how he fully preaches and practises pUrvAchAryas' words, etc. This nishtai is defined as the ultimate position of a sishyan towards his AchAryan - constantly glorify the AchAryan and serve him and other bhAgavathAs. His vaibhavam/charithram is already documented in http://guruparamparai.wordpress.com/2012/09/07/embar/. Let us pray to embAr that we also develop such attachment towards our AchAryan. archived in http://ponnadi.blogspot.com, also visit http://guruparamparai.wordpress.com, http://srivaishnava-events.blogspot.com. thirumalai nambi gives gOvindha perumAL as (dhAnam) donation to emperumAnAr since emperumAnAr wanted gOvindha perumAL's assitance in his activities in srIrangam. gOvindha perumAL reluctantly leaves with emperumAnAr - but returns back to his AchAryan (nambi) out of unbearable separation. nambi, instructs him to go back to emperumAnAr, since he was given as dhAnam to emperumAnAr. He cites an example at that time: When a cow is donated by some one, that time onwards, the cow should go to the new owner's house (cannot come to the donor's house as normal routine). The cow then becomes the property of the new owner and the new owner needs to take care of the cow. The same way, nambi says that, since gOvindha perumAL was given to rAmAnujar as dhAnam, gOvindha perumAL needs to be with rAmAnujar only. Thank you so much Dear Sarathy Swami for this wonderful compilation.